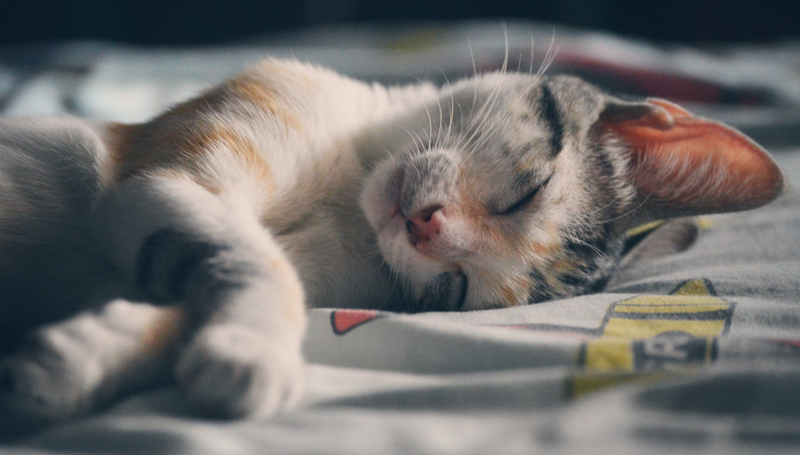 Did you know that cats can nap an average of fifteen hours a day? Well, according to petmd.com some felines can nap as long as twenty hours out of twenty-four, and there is nothing wrong with their health either. With this much sleeping, we tend to notice various sleeping patterns in our feline companions which we may not readily decode. As much as cats are lovely, they have a pretty mysterious nature. It is true that we can tell a lot about how cats understand their environment and how they respond to it from their behavior including sleep patterns. 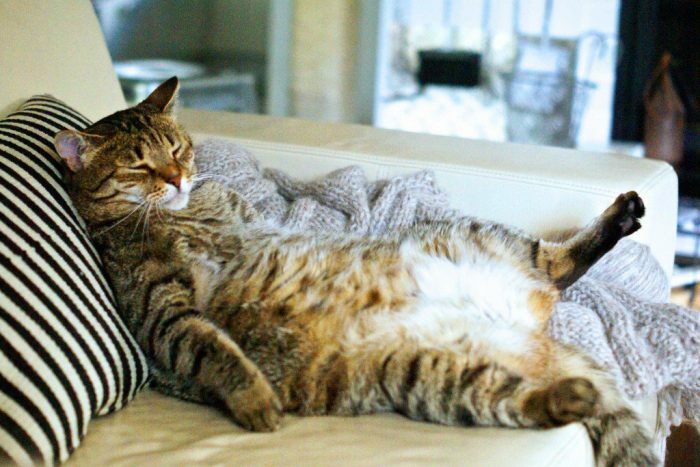 Here are seven sleeping positions your cat will always display and what they really mean. 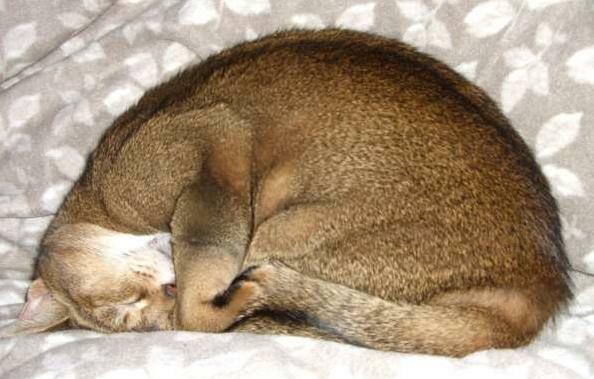 What we humans like to call the fetal position, to a cat is curling up into a crescent with the tail running around the paws towards the head; this does not necessarily mean discomfort to cats as we are usually not comfy in the fetal position. Your cat is not afraid of the environment even though it is clearly not taking any chances by revealing vulnerable body parts. Also, this position means that the cat is trying to retain body temperature. Animals in the wild will never close their eyes in the open, this instinct to protect themselves is intrinsically woven into their nature. For cats, even with domestication, sometimes they merely feel the need to hide away in safe, warm, cozy places. You will sometimes find your cat hidden away in your closet, inside dirty clothes in the clothes basket, inside boxes or even underneath the curtains. Sometimes the cat is just looking for alone time and does not wish to be disturbed. Cats are predators, and that fact will not change however domesticated they are. One thing about predators is that they hunt and consequently do not like the thought of being hunted in return. 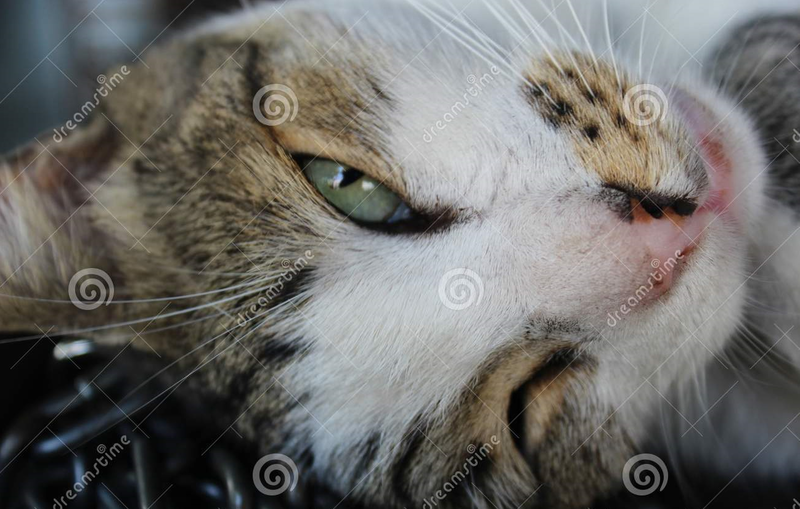 For this reason, you may notice that even though the cat is dozing off, it's not closing its eyes all the way. While in this position, you may also realize that the cat's ears are actively moving about; this is a very shallow form of sleep which can last for hours. The cat is acutely aware of what is going on in its surroundings, and any slight noise or unusual sound will jolt the cat into complete attention. There is another version of this kind of sleeping where one eye is wide open, and the other is entirely shut. This form of sleep is known as Unihemispheric Slow-wave Sleep which is when one part of the brain is unconscious while the other is awake. It is characterized by one closed eye with the other open. The half of the brain asleep is usually in a deep sleep, a form of NRM. This sleeping pattern is beneficial since it provides rest even in places with a sense of threat. At times a cat may sleep on its back with the hind limbs stretched out and the front ones folded on its breast. In this position, the cat is usually fast asleep and feels secure and safe in its environment. This kind of vulnerability does not happen a lot because it shows that the cat has thrown care to the wind. You may notice your cat sleeping like this when it's content and is in your company or that of people it considers family and safe to be around with. 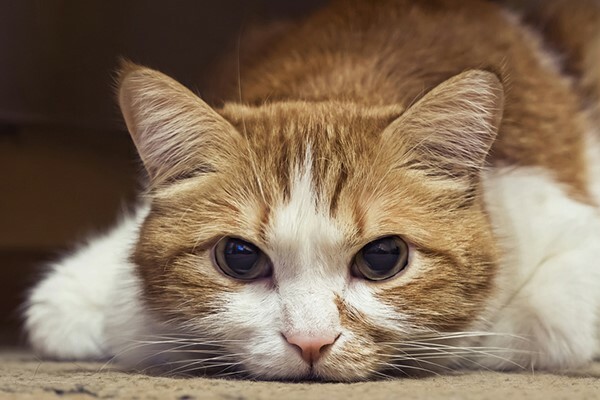 However, startling a cat in this vulnerable position is not a good idea; it could lead to scratches or bites. Learn more from fellow cat lovers here. 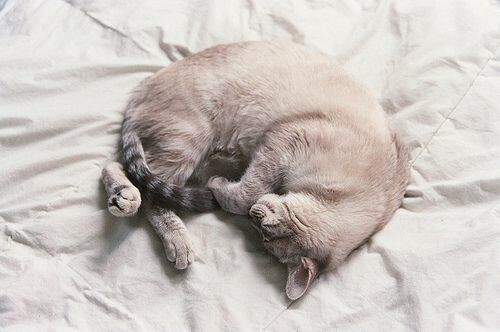 There is nothing as adorable as seeing your feline friend asleep snuggled into a ball of fur, right? But this position is not likely to presage anything good. If you have seen a sick cat, then you may have noticed that it tends to compress itself on all fours with head bent and eyes tightly shut. When a cat does this, it could be a sign that it is suffering from something and is probably in pain. 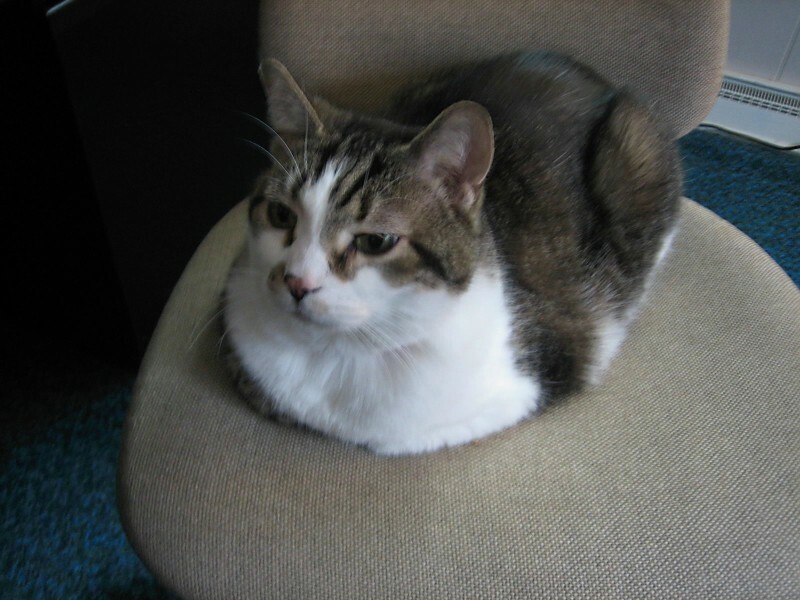 It might indicate serious health problems as the cat feels like it should stay in an elevated position. This position could also mean that the cat does not feel secure in its environment and it is anticipating threats. You may not be aware of what your pet does to signal you to what is happening to them, or you may be noticing weird pet behavior you can't accurately pinpoint. If you are looking for info from pet lovers like yourself, then check this out. This is one of the most comfortable sleeping positions for cats. When your cat sleeps on its side with the limbs outstretched, it means that your cat is not just content, but that it does not see any need to stay alert; this is a relaxation mode which usually results in deep sleep. If you want to find out more sleeping patterns of your favorite pets, then go here. Cats are fascinating creatures with little tidbits of mystery about them. But since they can't speak to us, it's imperative that we learn what we can about their habits to know what is in fact out of place and what is typical kitty behavior. Maybe you want to alter your cat's sleeping pattern, or you just want to know more, check this site out. Sometimes a cat will sleep on all fours but the limbs are safely tucked away inside, and the tail is either outstretched or weaved around it. This position shows that the cat feels safe and comfortable, but it does not mind some action if there is any. After a while, the cat's head may drop on the floor; this should not worry you. Your cat is merely feeling lazy, and it's a good thing, but it also prefers to stay upright just in case something interesting presents itself.